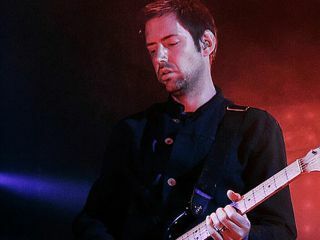 Radiohead's Ed O'Brien: "We want a fair deal"
Radiohead guitarist Ed O'Brien has written a blog about his involvement in the Featured Artists' Coalition, the FAC. The FAC recently met in London to discuss how artists get a better deal in the digital-distribution age. Other UK artists present included Blur's Dave Rowntree, KT Tunstall and Billy Bragg. "Hopefully we can not only do artists justice but also the people who listen to our music. After all, in order to be a musician you have to be a music fan …… And first and foremost this is about trying to ensure that young bands and artists get a fair deal and are able to make a living in the digital era …. "Timing is everything and with a man like Barack Obama in the Whitehouse, it's a moment to set up a really great and dare I say it noble organisation." More details on the FAC. Radiohead are currently touring South America.